Since my last post, I received the book Bread Science in the mail, and I’ve baked two loaves of sourdough. Loaf No. 6 was crap. I didn’t bother taking any photos of it. Loaf No. 7 was perfect in my eyes and in my mouth. The day that I received the book, I devoured it. I was a bit disappointed with it. There’s a lot of science but half of it doesn’t translate through to actually baking at home. On the other hand, I was able to read between the lines and figure out what I’ve been doing wrong. So, all in all, the book helped in spite of its holes. Here’s what I’ve learned. As I wrote in the previous post, my first mistake was not using a flour with a high enough protein content. This I learned before I got the book. My doughs have been too dry. I tend to add flour during the kneading process to make it non-sticky. Sourdoughs seem more sticky than other doughs I’ve worked with. Water and salt are needed to make the gluten form. In looking at the photos in the book, the author’s dough was pretty wet looking. She wrote about sometimes needing a dough scraper to get the dough off of the board. The “window” test is where you stretch the dough into a thin membrane and can see light through it. I’ve known about the window test, but never successfully got a window. Between the low protein flour and the dough being too dry, the window would always break. Today I left a lot more moisture in the dough and kneaded it while it was sticking to everything. I don’t know how much of difference this makes, but the author doesn’t add the salt until the kneading stage. Today I did that as well. And I got a good window! One thing I’ve always lacked is “oven spring”. This is when the dough expands in the oven. Mine has never expanded. It always stayed the same size as when it went into the oven. I’ve tried steam and other remedies to no avail. I think the primary reasons are what I’ve mentioned before. One thing I learned from Loaf No. 6, is that the author’s oven temperature is way too high for 8300 feet elevation, even with steaming. For Loaf No. 7, I had a large roasting pan sitting on the bottom of the oven, with about 1/4 inch of water in it. I also spritzed the dough with water from a spray bottle before sticking it into the oven. To get oven spring, you need to keep that outer layer of dough soft enough so it can expand. This all happens in the first 10-15 minutes of baking. Water, water, water! It’s the elevation because water evaporates so easily. After 15 minutes I pulled the roasting pan out and let the bread continue baking another 20 minutes (total of 35 minutes for the boule). My oven was at 375. I checked the internal temperature of the bread at 30 minutes and it was 170. It should be around 180 or higher. So, I let it go another 5 minutes. At this elevation, water boils at 190. I’m thinking if internal temperature of the bread is over 190, the bread is overcooked and dried out. Good texture, good flavor, thin but very crispy crust. 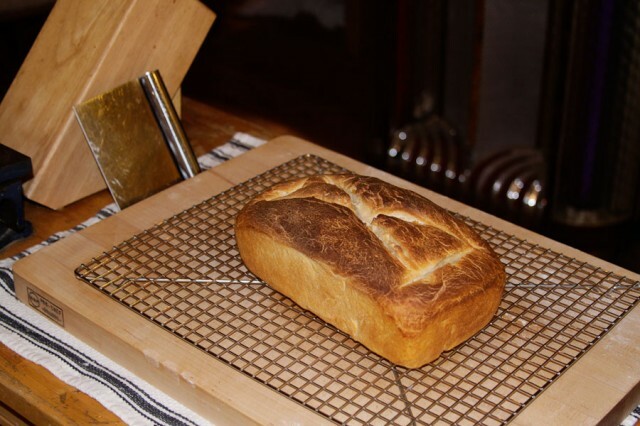 This bread is so good, there’s nothing I need to improve. And now that I have much better handle on the dough moisture while kneading, it will be much easier to make in the future. Sourdough bread takes a long time, but not much work. I let it ferment for about 6 hours after kneading, punching down once. Then let it rise for two hours once it was in the pie pan. 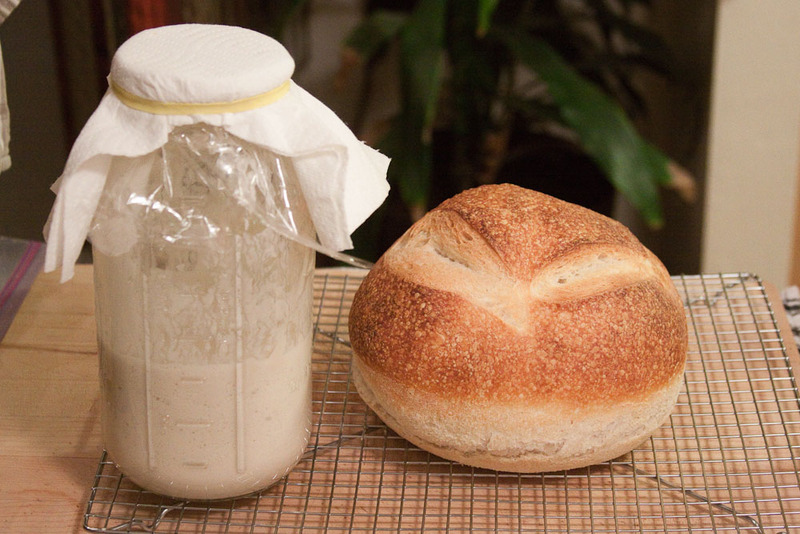 This sourdough starter seems to make more alcohol than CO2. That was probably good because the dough kept moist during all that time. Edited to add: I just realized that Loaf No. 7 is actually Loaf No. 6. I counted wrong. But I’m not changing it. Seven is lucky after all. I’ve made four loaves of bread using the sourdough starter I got from Whole Foods. Two of those loaves were actually a single loaf dough divided in two, one kneaded more than the other. I’ll come back to why I was doing that in a moment. 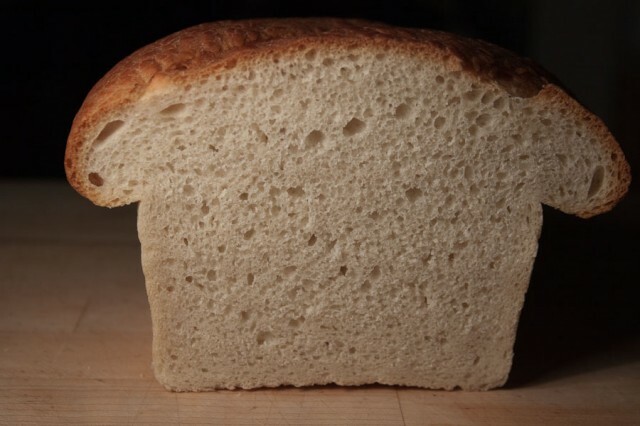 Loaf #1 with distinctive hour glass design in the top. I’ve said it before, I love home-baked bread. I’m also somewhat of a perfectionist, control freak, and an engineer. Combine that with something as variable and bratty as bread and it becomes an obsession to master it. 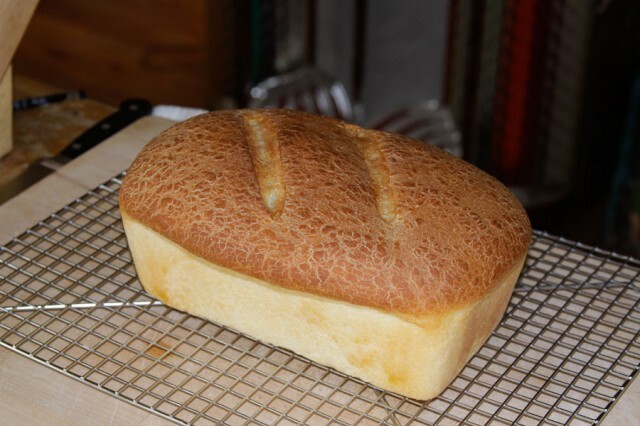 I’ve been baking bread regularly for 20 years and I’m still learning how to do it. The overall procedure is a little different when making sourdough. And sourdough starter seems to make the dough more sticky, confusing me when determining the proper balance between liquid and flours. All of this has me re-examining bread making in general. I’m living at 8300 feet in elevation, where the leavening power of either yeast or sourdough starter doesn’t have to be as strong. I want to harness that advantage. Loaf number 1 had great sour flavor, but it was a little dense and dry. The next loaf I made, I decided to divide in two. I left one fairly sticky. For the other I added more flour and kneaded a little longer. I baked them as rounds on a cookie sheet. The result: the sticky one rose more and had a better texture, the opposite of what I expected. Unfortunately I didn’t take a photo. Friends arrived as the bread was coming out of the oven, and needless to say, there wasn’t much left by the end of the day. One of those friends is another engineer. Mike looked at me while he thought up an answer. He threw out a guess, but added he didn’t know. The next day I took to the internet and found more contradictions. But I did stumble upon a book called Bread Science: the chemistry and craft of making bread. Just what I need. I ordered a copy and I hope it arrives soon. I re-watched a saved copy of Alton Brown’s show Good Eats, wherein he makes bread. If you’ve never seen an episode of Good Eats, Alton dissects the foods he makes and gives the viewers the associated history/scientific/engineering background. One thing very important for bread is the protein content of the flour. This is directly related to how much gluten the flour will make. I’ve always used All-Purpose flour for my bread. Sometimes I’ve added wheat gluten to give it a little boost, but the bread ends up too gummy. 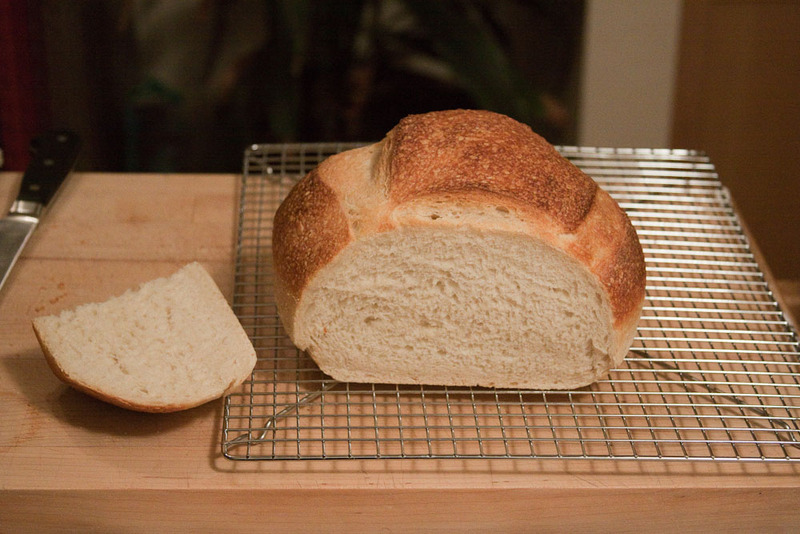 Among All-Purpose flours, I’ve noticed big differences in how well they make bread dough. Not all flours are created equal. The next day I made Loaf Number 4 with the King Arthur flour. The crumb (the inside meat of the loaf) had perfect texture for sourdough. Nice texture for a sourdough. Firm, some bubbles -- a good sandwich bread. I've never been a fan mushroom shaped breads, I usually make round ones. But this will do for now. However, the King Arthur flour had kind of weird smell to it, like mildew and old paint. I checked the expiration date and it doesn’t expire for a couple of months, but I think it’s old. The expiration on Bob’s flour is 2014, at least a year fresher. So I think I’ll pick up another bag of King Arthur from a different store and see if has the same smell. It might just be the natural flavor of a different strain of higher protein wheat that I’m not used to. In any case, the smell is hardly noticeable in the finished loaf, so I think the loaf is worth keeping. The sourdough didn’t have a very strong flavor in this loaf, but that’s my fault. I had put the starter in the refrigerator to slow down its metabolism because I wasn’t expecting to make another loaf so soon. I’ve run across a term on the Internet — Artisan Bread Maker. I might be one of those. I think simple is better. I make whole wheat bread the most. Once I master the white sourdough, I want to make a whole wheat version. More to come. I’m sure of it. One of the few things I like about the Whole Foods Market, is their sourdough bread. They bake it right there in the store. It’s almost as good as what you can get in San Francisco. And some batches are superb. I stopped by after work to pick up a few things and on an impulse decided to ask a bakery worker if they sell their sourdough starter. Really, much to my surprise he said yes. He packaged up a dollop of dough for 99 cents and off I went. About 8 years ago, I spent a lot of time and effort trying to get my own starter going. And I did get it going and made dozens of loaves over a couple of month’s time. It eventually turned a shade of green and I discarded it. It’s hard work to keep sourdough alive and well. It requires regular feeding like any other creature. And warmth. Once I was home with my dollop of starter, I realized I didn’t have anything to keep it in. Even though I keep buying large canning jars, there’s never enough. After transferring my oatmeal into a plastic container, had a 2 quart jar that I could use. I’ve taken the starter and added some flour and water, stirred, and placed it into the jar. I covered the jar with several layers of paper towels and secured them with a rubberband. Cheesecloth would be better, but I don’t have any. I put the jar in a semi-warm place. Ideally it should be in the lower 80’s, but it’s in the mid-70’s. With any luck, I might have enough to make bread sometime this Thanksgiving weekend. I’ll keep you posted on how it goes.